Ooh! I could feel it in the air today... a cool, crisp, blue-sky, breezy kind of day...a few leaves fluttering down. Yes, autumn is in the air even though it's not yet here. So I painted an autumn scene that was inspired by a path around a lake in New Hampshire, one of my favorite places to be at this time of year. Paper birches are abundant in that area and so pretty with autumn foliage. You can find my birch tree art prints for sale in my Fine Art Prints Shop. 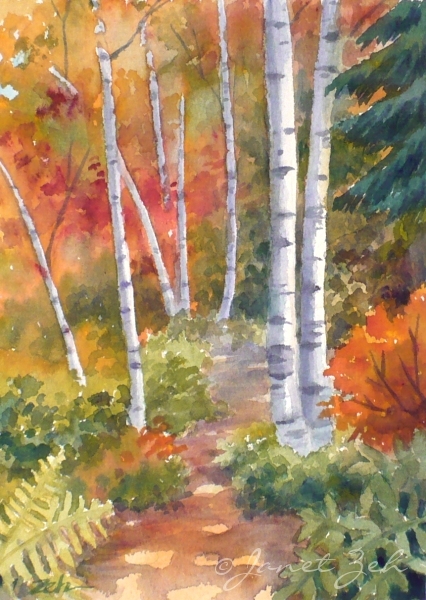 Original birch tree paintings are in my Original Art Shop when available. Dipti, thanks so much! I appreciate your comment. Glad that the fresh quality comes through, just like the fresh autumn air.